MMS JANUARY 2018 62 mmsonline.com CUTTING TOOLS | RobbJack | 800-527-8883 | robbjack.com for specific applications in these materials, although other vibration-control techniques are likely to be needed for full effectiveness in these cases.) It is said that end mills with Mirror Edge can be used at a machine tool's highest spindle speed in aluminum without any chatter. This enables the feed rate and metal removal rate to increase substantially. 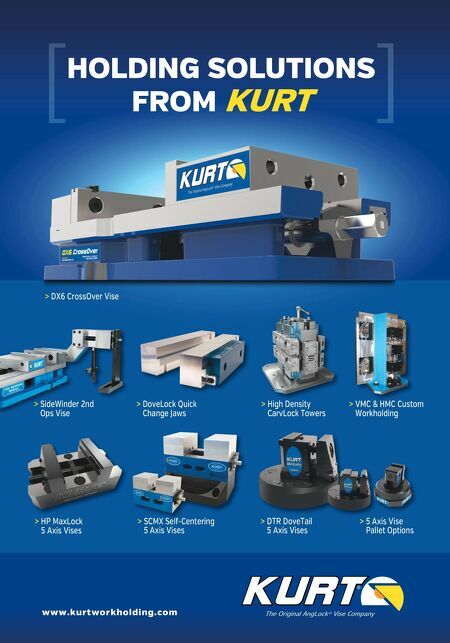 Stepovers that are 50 percent of the tool radius are recommended, along with chip loads equal to the tool diameter times 0.016-inch per f lute. Mr. MacArthur says that applications with deep pockets and/or thin walls are the most suitable for these end mills, however, certain programming techniques are in order for machining thin walls. For example, each Z level of a pocket should be roughed and finished before proceeding to the next, lower Z level. 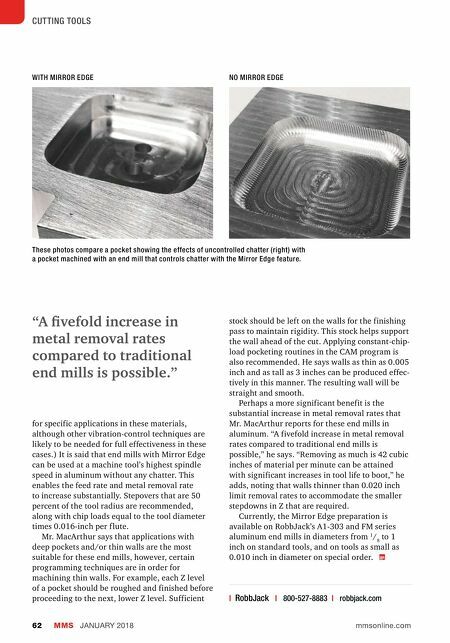 Sufficient "A fivefold increase in metal removal rates compared to traditional end mills is possible." These photos compare a pocket showing the effects of uncontrolled chatter (right) with a pocket machined with an end mill that controls chatter with the Mirror Edge feature. NO MIRROR EDGE WITH MIRROR EDGE stock should be left on the walls for the finishing pass to maintain rigidity. This stock helps support the wall ahead of the cut. Applying constant-chip- load pocketing routines in the CAM program is also recommended. He says walls as thin as 0.005 inch and as tall as 3 inches can be produced effec- tively in this manner. The resulting wall will be straight and smooth. Perhaps a more significant benefit is the substantial increase in metal removal rates that Mr. MacArthur reports for these end mills in aluminum. "A fivefold increase in metal removal rates compared to traditional end mills is possible," he says. "Removing as much is 42 cubic inches of material per minute can be attained with significant increases in tool life to boot," he adds, noting that walls thinner than 0.020 inch limit removal rates to accommodate the smaller stepdowns in Z that are required. Currently, the Mirror Edge preparation is available on RobbJack's A1-303 and FM series aluminum end mills in diameters from 1 / 8 to 1 inch on standard tools, and on tools as small as 0.010 inch in diameter on special order.